This was going to be our second trip to South Africa and we wanted to give back something after having such an amazing adventure the first time. 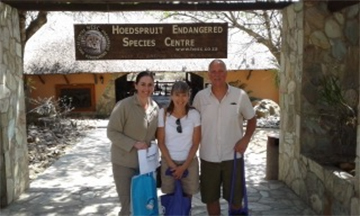 So, I started to do some research and came across Pack for a Purpose which works with the Hoedspruit Endangered Species Centre (HESC) who we had visited during our first trip in May 2016. It happened that we would be travelling by the HESC on our most recent visit in October 2017. After contacting the HESC and indicating that we would be passing by and would like to drop off some school supplies for the local village school program which they supported through Pack for a Purpose, they were more than happy to greet us and receive the donations.